As a human male living in a developed nation, I usually stand up when I micturate, using a urinal of some type. There’s not much to do while relieving myself, so I’ve taken to examining the things directly in front of me (I certainly don’t want to examine the things to either side, which are often other men relieving themselves). There’s one thing that every urinal has that I look at when I use it: the exposed plumbing fixtures, and flushing handles if present. These things are called flushometers. 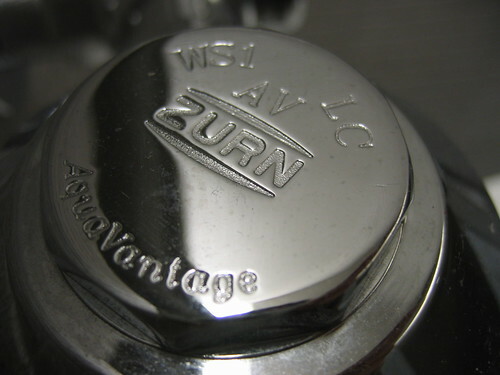 Of the urinals I’ve used in recent years, almost all of them have flushometers from one of two companies: the Sloan Valve Company or Zurn Plumbing Products. There are a few oddball urinals with no-name flushometers, but they are few and far between. I don’t recall ever seeing another brand name flushometer with any kind of regularity – either it’s such a niche market that there’s not much room for competition, or the current players are so prevelant that new competition doesn’t stand a chance. Of the urinals using one of the two major brand names, the overwhelming majority use Sloan products. The most popular model is the Royal. Locally there are a few Regals; but Sloan has a whole line of flushometers I’ve never seen! With such a broad selection, I wonder why so many places choose the Royal or Regal models. Of the Zurn product line, I’d only ever seen the Aquaflush (and the occassional automated model). Until just the other day, that is. I discovered the AquaVantage at the OSU RPAC. I admit I’m very probably the only person in the hemisphere who would notice (let alone photograph!) such a thing.